“Georg Kulenkampff was one of Germany's most beloved violin virtuosos of the first half of the twentieth century and a teacher to many younger stars of the violin. 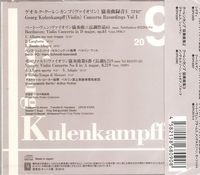 Kulenkampff gave the premiere performance of Robert Schumann's violin concerto and made the first recording of the piece; additionally, his performances of the violin concertos of Beethoven, Mendelssohn, Glazunov, and Bruch are considered among the finest on record, despite their having been recorded during the 1930s and the beginning of the 1940s. Only the fact that his recording career coincided with the Nazi era, coupled with his tragically early death from encephalitis, has prevented his name from being better known to modern listeners. Georg Kulenkampff was born into a family of very successful Bremen merchants and raised in happy, well-to-do circumstances. He showed an interest in music very early in his life and at age six, was given his first violin. Soon after, he began studying with Hans Kolkmeyer, the concertmaster of the Bremen Orchestra, and later with the orchestra's conductor, Ernst Wendel. He later studied with von Auer in Dresden and in response to von Auer's encouragement, Kulenkampff's parents presented the 12-year-old prodigy with a Stradivarius violin and sent him to the Berlin Conservatory. Kulenkampff spent the years immediately after World War I recovering from serious health problems and became concertmaster of the Philharmonic Society of Bremen. His concert and recital career grew by leaps and bounds and a few years later, he moved to Berlin, becoming a professor at that city's conservatory. From the mid-'20s onward, Kulenkampff was Germany's leading violin virtuoso, concertizing all over the country and throughout Europe and he also making regular appearances on the radio. In 1935, Kulenkampff formed a trio with Edwin Fischer and Enrico Mainardi, with whom he performed for the next 13 years. Additionally, Kulenkampff was one of the most respected teachers of his era and his students included the young Yehudi Menuhin, among many others. His master classes and lectures were unique for their passion, depth, and intensity. One of the top recording artists of his era, Kulenkampff left behind many examples of his work from the 1930s and 1940s, including the first recording (done shortly after the premiere performance) of Robert Schumann's long-suppressed violin concerto in 1935. The story of the violin concerto's premiere is a fascinating one and illustrates the esteem with which Kulenkampff was held in Germany. Schumann's intent of conducting the piece in Dusseldorf in 1853, in a performance by Joseph Joachim, had never been realized, owing to insufficient rehearsal time and Schumann's own failing health; the Beethoven violin concerto (itself not a popular piece until then) was played instead. After several failed attempts to secure performances of the work, Joachim decided with Schumann's family that the piece should be suppressed as unworthy of the composer's memory. Joachim arranged that the concerto should not be published until 100 years after Schumann's death in 1856. In the 1930s, however, two of Joachim's grandnieces began making attempts to have the work performed. Their efforts culminated with Kulenkampff's performance of the concerto in November 1937. With help from Paul Hindemith (whose own work had already been banned by the Hitler government), Kulenkampff and Georg Schunemann undertook a series of alterations - which Schumann himself had begun - to make the concerto more playable. Ironically, the world premiere was to have been played in San Francisco by Kulenkampff's one-time pupil Yehudi Menuhin, under the aegis of the publisher, but the Nazi-controlled government insisted that the work had to receive its first performance in Germany in the hands of Kulenkampff, as Germany's greatest violinist and an ‘Aryan’. For his part, Kulenkampff - despite his having remained in Germany for most of the Hitler era - took none of these racial concerns seriously, insisting on using the cadenza by Jewish virtuoso Fritz Kreisler in his performances and recordings of violin concertos of Beethoven and the otherwise banned Felix Mendelssohn in 1935.